Dr. Bill Osmunson is an avid supporter of fluoride opposition in the US. He’s particularly suited to discuss the health dangers of fluoride, not just because he’s been a full-time dentist for over three decades, but also because he has a Masters in Public Health (MPH). He’s also a missionary kid. His parents were missionaries in Africa. Growing up in Kenya, he’s had the opportunity to see life from a different perspective than most of us. So, how did a dentist come to the conclusion that fluoride—which is so heavily promoted within dentistry—is detrimental to your health? “I promoted fluoridation for 25 years,” Dr. Osmunson admits. But then his patients began questioning it and urging him to review the science once again. “One of the earlier gentlemen that worked with me… said, “Bill, what about the freedom of allowing people to choose fluoride or not?” I remember my mouth opening up to respond and nothing came out, because I’m very much in favor of freedom. I want people to have the freedom to choose the chemicals, the drugs, whatever they’re doing. … I was certain fluoride was beneficial. I could see it in my patients’ teeth. I was just absolutely certain that it was. When you have a tooth that’s really hard and shiny and looking good, and no decay, that’s the one that’s had fluoride, right? Well, I found out I was wrong. “Is it appropriate to put in the substance into water, where some people may drink less than a liter a day and others drink up to 19 liters a day?” he asks. ”That’s a huge difference in the dosage amount of fluoride that they are getting. And what about the other sources? What’s the Best Way to Reduce Fluoride Intake? Water fluoridation, which eliminates individual choice, should be removed as a first step. But, avoiding fluoride toothpaste can be another important factor. As you probably know, mercury in dentistry is a massive health threat. Dr. Osmunson recounts a number of health problems he frequently saw in his patients, such as temporomandibular disorders, migraines and headaches. But he began to question whether fluoride, in addition to mercury, might be part of these problems. “I was looking down at this basket of Crest toothpaste and said, okay Bill, you’re a nutritionist. You got your Masters in Public Health in Nutrition. What does it say? So, he started doling out pea-sized amounts of toothpaste onto a piece of paper to check how much toothpaste they’re actually referring to, and to his great shock, he realized that “pea size” really means a “tiny baby pea size”—about half the size of a regular pea. At that recommended rate, one tube of toothpaste should actually last you several years! That’s how little you should use to remain within safe limits. According to the research literature, you should brush with no more than one-quarter of a milligram of fluoride, and call Poison Control if you swallow that amount… When you see a toothpaste ad, that long swirl of toothpaste is actually more than one month’s worth! “There seems to be a disconnect there,” Dr. Osmunsen says. “They tell me not to swallow a quarter milligram of fluoride in my toothpaste, but they are forcing me to swallow a quarter milligram in just one glass of water. … It’s unbelievable. We know that we’re getting some neurologic damage at very low levels. However, the latest research is even worse than that. We’re finding an 8-point IQ drop when the serum blood level of fluoride goes from 0.04 to 0.08. … The American Dental Association recommends that a woman have about 3 mg per day of fluoride as optimal and men about 4 mg per day as optimal. That is the same amount that causes between a 0.8 and a 0.12 level of fluoride in the blood. Water Fluoridation = Profitable Toxic Waste Disposal! China, in contrast, does NOT allow water fluoridation because it’s too toxic and causes damage, according to their studies. Instead, the waste product from their phosphate fertilizer industry is shipped to the United States, where we add it to ourwater supply! This is a very important point: the fluoride added to your water is NOT pharmaceutical grade. It’s a toxic industrial waste product, which is also contaminated with lead, arsenic, radionucleotides, aluminum and other industrial contaminants. About 75 percent of Americans get fluoridated water, and just over 65 percent have artificially fluoridated water with hydrofluorosilicic acid; the toxic waste product from phosphate industries. Meanwhile, naturally occurring fluoride is found in many water supplies, especially in volcanic regions and areas with harder water. The Environmental Protection Agency (EPA) does not distinguish between these two types of fluoride, but they should. Naturally occurring fluoride in hard water areas often has a calcium fluoride. Calcium and fluoride bond very well and are not absorbed well by your body. Hydrofluorosilicic acid, on the other hand, dissolves easier and is absorbed by your body at a greater rate. Amazingly, as Dr. Connett states, there are no less than 23 more studies from four different countries indicating thateven moderate exposure to fluoride lowers IQ in children. 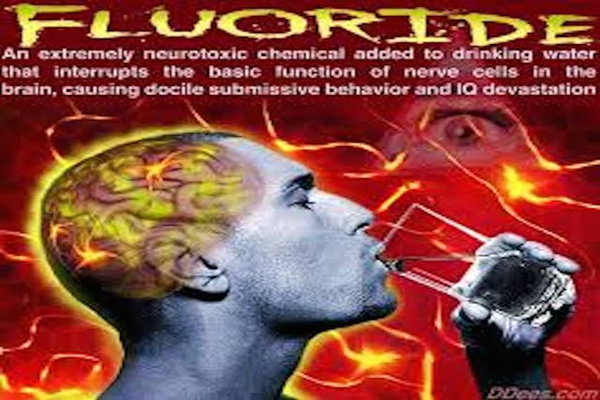 This study indicates a 5 point lowering in IQ as the fluoride level in drinking water went from about 0.3 ppm to 3.0 ppm. Dr. Osmunsen also expresses deep concerns about the economic impact of brain damage, stating that you lose about $500 to $1000 dollars per year in income for every IQ point that is dropped. “No one fixes IQ,” he says. ”This is an irreparable, irreversible damage that’s happening to our public. So, Does Fluoride Benefit Your TEETH? The early historic studies on fluoridation found that naturally occurring fluoride also happens to be found in areas that are high in calcium and other minerals. According to Dr. Osmunson, many dentists at the time theorized that this higher mineral content might be the real reason for the reduction in tooth decay. There were some compelling studies showing that fluoride made teeth harder and more able to withstand acids. However, upon further review of the research literature, Dr. Osmunson realized that the evidence supporting fluoride really wasn’t as strong as initially touted, and fluoride did not appear to reduce tooth decay to any significant degree. In fact, he discovered plenty of scientific evidence showing that areas with LESS fluoride had less decay. “One of the things we found out is that socioeconomics is a key factor,” he says. ”You can’t compare the rich and the poor, otherwise you’re going to find a change. And you must get the [tooth] eruption cycles correct. There are many other confounding factors that play a role. So I said, “What’s a logical way of looking at this? A public health intervention should be measured in the community at large. That’s one of our precepts and rules. You should be able to measure the effectiveness of the public health intervention in the public at large. You should see a reduction in cost for treatment. We have fluoride that we’re in essence giving like a vaccination. We’re giving it to people. And what do we find? I could only find one study published of measured evidence. All the other studies were estimates based on assumptions. So we don’t really have good measured evidence. The study that measured evidence found… about one-half percent savings. Interestingly enough, when looking at the two largest communities of the children, the children in the non-fluoridated community has less cavities, less costs, than those in the fluoridated community. But in any case, there was a slight improvement—enough to pay for the repairs of the equipment. Not enough for the chemicals. Not enough for putting in the equipment. Dr. Osmunson touches on an array of health problems caused by fluoride ingestion and exposure through the skin in this interview. To get all of it, I highly recommend listening to it in its entirety. For example, fluoride easily accumulates in your pineal gland. In fact, your pineal gland has the highest concentration of fluoride of any organ in your body, even more than your teeth and bones. This can wreak havoc with your melatonin production, which in turn can disrupt your biological clock and even influence your cancer risk. Another area of great concern is your thyroid gland. As your fluoride load increases, your thyroid hormone production tends to decrease. Not only can this contribute to hypothyroidism, but it also increases your risk of developing goiter. If you’re iodine deficient, the negative effects can be magnified, as fluoride (as well as bromine) has a similar molecular structure as iodine and can take the place of iodine in your thyroid. Folks, Dr. Osmunsen is a wealth of information on this topic, and I’ve only summarized a portion of it here. So please, take the time to listen to the interview, or read through the transcript for more information. In the end, there’s no doubt about it: Fluoride should not be ingested. When it comes to topical application, at least you have a choice. You can easily buy fluoride-free toothpaste and mouthwash. But you’re stuck with whatever your community puts in the water, and it’s very difficult to filter out of your water once it’s added. Many do not have the resources or the knowledge to do so. The only real solution is to stop the archaic practice of water fluoridation in the first place. Earlier this year I joined forces with Dr. Paul Connett to do just that. The Fluoride Action Network has a game plan to END water fluoridation in both Canada and the United States. Our fluoride initiative will primarily focus on Canada since 60 percent of Canada is already non-fluoridated. If we can get Calgary and the rest of Canada to stop fluoridating their water, we believe the U.S. will be forced to follow. The point person for this area is Carol Kopf, at the New York Coalition Opposed to Fluoridation (NYSCOF). Email her atNYSCOF@aol.com . Please contact her if you’re interested in helping with this effort. Amazing that there is ZERO mention of the fluoride in almost ALL TEAS. It comes both from industrial pollution precipitated into the soil, and from naturally-occuring fluorides in the soil, which is generally depleted over time. Most tea vendors either do not specify the amount of fluoride in their products, OR they tout the “health benefits” of fluoride! FYI, the organic white teas reportedly have the least fluoride. Because of the almost TOTAL lack of fluoride data on particular products, we are forced to rely on the “organic” label and on the reputation of the producers and vendors. So for us, it’s “organic white” or nothing.